Accused 09.01.1873 of being open out of hours. Convicted 28.08.1885 of allowing gaming. Location given in August 1852, when new licence issued, as ` on corner of Hangman's Lane'. Thomas Riches was jailed for one calendar month on Monday 5th October 1868 for assaulting his wife on the previous Friday evening. He had struck her several times when he discovered that she had not paid the rent with money that he had given her for that purpose. The assault had been repeated on the Saturday morning. Mr. Riches claim of provocation was over-ruled and he was advised that he would serve an extra week in prison should he not pay the costs of the court appearance. Before the magistrates Saturday 28th August 1885 it was heard that on 21st August 1885 three men had been observed playing dice at 1/2d a throw in order to win beer. Three measures of beer had been drawn and a total of nine throws were required to raise the 4½d required to pay for the beer. Licensee Robert Church said he was not aware he was raffling and breaking the law. He had allowed such games previously. The Bench said his ignorance of the law was inexcusable. Severely damaged by enemy action 27/29.04.1942. 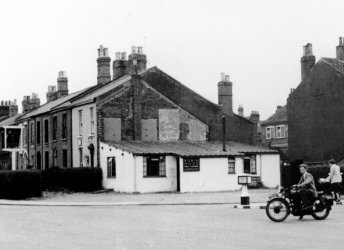 Business carried on in a `temporary' wooden hut until Morgans advised that they intended to close the house 07.08.1956 and relinquish the licence.